In honor of the Plantinga article in the NYT today, I'm republishing a post I wrote when he visited SMU last year (2/4/10). I think the talk covered some of the same ground as his new book. No, God didn't talk at SMU yesterday, but Alvin Plantinga did. He gave a talk called "Science and Religion: Where the Conflict Really Lies." From that title, you'd expect to hear Plantinga concede some tension between science and religion, right? But no. Surprise, surprise, the "religion" that conflicts with science isn't religion--like Christianity, for example. It's naturalism. Christianity is compatible with evolution; naturalism is incompatible with rationally accepting evolution. So: things are not at all what they seem. A quick observation, before I go on. I don't think Professor Plantinga likes Professor Dawkins very much. Early in the talk, he called The God Delusion "an uninformed screed" and a very bad book (or something to that effect). Quick theory: Dawkins drives people crazy because he makes it look so easy (and so fun) to attack theism. If only he would huff and puff a little more, and admit to being intimidated by the depths of contemporary theology. But no: he treats it as simple-minded nonsense. Moving right along. Christians have to think that God created humans "in his image," and so can't go along with unguided evolution--Plantinga argued. But why must unguidedness be seen as essential to the theory of evolution? Christians can accept all the main tenets of the theory of evolution, just so long as you don't think unguidedness is one of them (he argued). About God guiding evolution. 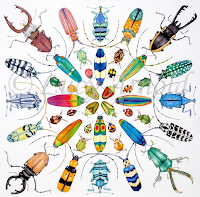 I can see why "people of the book" will insist on God having a hand in creating humans, but if you grant him general guidance over the evolution of species, you wind up with a god who both wanted there to be creatures like himself (in some sense), and wanted there to be 380,000 species of beetles. What was that all about? Anyhow--the major fireworks in the talk were in the final section, where naturalism was revealed to be incompatible with rationally accepting evolution. Note: not incompatible with evolution, but with rationally accepting evolution. Suppose you believe in naturalism (no God, no spooky objects, the laws of nature, etc) and (unguided) evolution. Then you've got to think your own brain is the outcome of natural selection and nothing more. In that's the case, then it's quite possible that your brain is not a very reliable generator of beliefs. Your brain does keep you from falling into ditches, starving to death, and the like, but it could simultaneously be misleading you quite horrendously about reality. Got that? If you do, then you're going to find yourself with much reduced confidence in your beliefs. In fact, you're going to find yourself without much confidence in naturalism and (unguided) evolution. So there's your conflict between religion and science. Add naturalism (which is a religion) to evolution (the unguided type). Shake. Drink slowly. Find yourself no longer confident of anything, including evolution. I won't spoil your fun by telling you how I think this argument goes wrong. I'm too busy wondering why God guided evolution toward 380,000 species of beetles. It really seems very Cartesian to me. Step 1: Introduce a radical skeptica context. (You just can't be sure of anything). Step 2: Introduce God a guaranteeor of our "clear and distinct ideas." Step 3: Validate our epistemological contact with reality and prove Christiantiy at the same time! Obviously I'm leaving out all the little steps. But Plantiga's argument seems to fail on every count (other than I think skepticism is a genuine ghost that haunts every "hard" epistemological effort). What I think is really funny about this stuff is how we get from a Supra(natural) entitity that boostraps us into a good epistemology to the same God who sent us Jesus. How the heck does THAT "proof" get made? Yes, it's very Cartesian. I'm chuckling about the last bit-- the same God who sent us Jesus. Indeed. Really good discussion of the issue, I think you'll appreciate it, whatever your current thinking. My brain often misleads me horribly about reality. Psychology books are full of examples of how the brain (or brain-mind) misleads us. In fact, if I look out my window, the world seems flat. Maybe Platinga has a newer model brain, with better software. Mine still has Windows 98. Next time you see Platinga, ask him if you download his software free. I don't see why unguided evolution has to result in broken brains. Unguided evolution led to fairly well working bodies, why would our brains be any more broken than our bodies? Moreover, we can accept everything that he says and still say that we might be biologically or evolutionary required to have confidence in our own beliefs. In fact, if we can lose our confidence in naturalism, that re-enforces the idea that our brains work well. If it didn't work well, we wouldn't see this problem. (I think this might be a little circular though).